We are always excited to see guests from Vienna at Cafesano and we’re thrilled to provide catering in Vienna, VA. We know there are many businesses located in this area and we have something unique to offer. Think about people who network for a living and hop from one event to another. Imagine how many chicken wraps, muffins, tuna sandwiches and potato salads they consume in a year. If you are looking to impress, think outside the box. 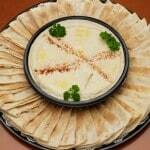 Mix cuisines of different countries or pick one, such as Mediterranean catering, and offer it in its full variety. Panini. Choose the classics like roasted turkey & cheddar or grilled chicken parmesan or surprise your guests with grilled portobello and refreshing prosciutto & mozzarella panini. Dip platters help gather everyone over a delicious meal and, therefore, are great for collaboration events, such as round tables, as well as networking. Grilled skewers and kabobs are always a hit – and easy to enjoy both while sitting down and standing up and even on the go.